This image was created after the sunset and there was a little color in the cloud line from the sun. We felt really lucky to get this image as Seattle was in the middle of a weeklong storm. However, for the day of this wedding, it stopped raining for about 4 hours. Just enough time to get outside with the bridal party and get some awesome December images. The Antheia Ballroom is a smaller venue ideal for smaller bridal parties.The venue is beautiful and very formal.The staff is amazing and the food is delicious. There is a back patio area that can be used for first looks and bridal party images weather permitting. 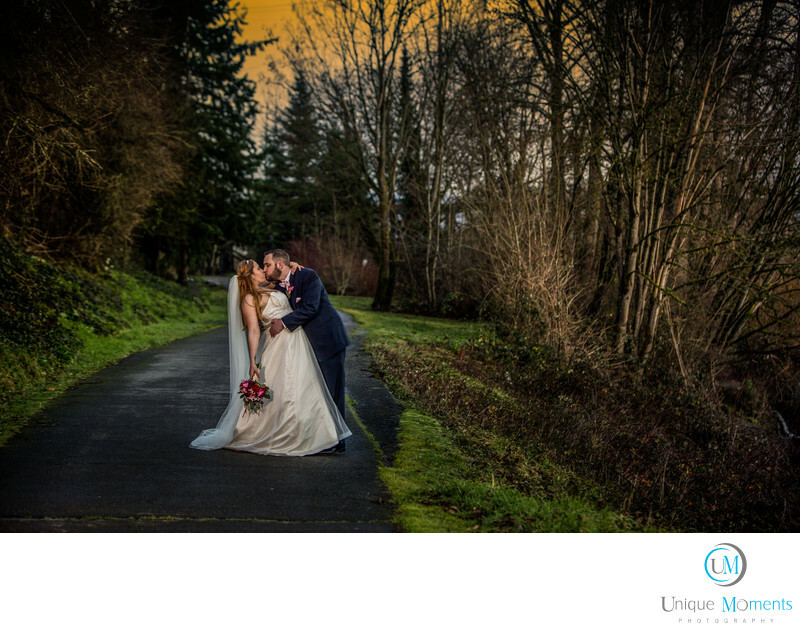 Downtown Snohomish also offers many areas for awesome wedding photograph images. Highly recommend this venue if you have a smaller bridal party. Location: 213 Ave D, Snohomish, WA 98290.